Welcome to the Valley Model Railroad Club! We are an HO Model railroad Club with two layouts. One layout is permanent and housed in the historic building of Clintonville Station, in South Elgin, IL. The other layout is portable, used on the road at train shows and other events. We are always looking for new members including families with kids. Please visit us at our permanent or portable layout for more information. Please check out our Calendar for operating times. Or email us at vmrrwebmaster@gmail.com. One permanent layout is and housed in the historic building of Clintonville Station, in South Elgin, IL. 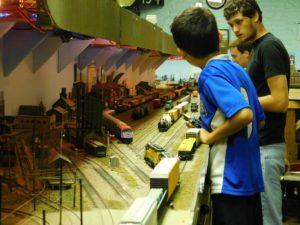 “Our mission is to engage young people in the rich history of railroading by showing them how our layout uses up-to-the-minute computer-based technology. 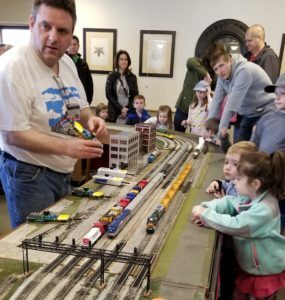 It’s about making the hobby accessible – something they can touch and experience on a personal level.” – Jim Pechous, Valley Model Railroad Club. Visit and like our new Facebook page.